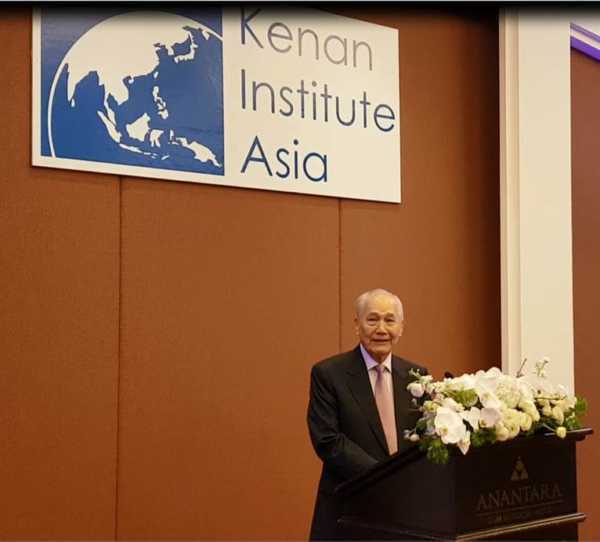 The Kenan Foundation Asia was founded 22 years ago by a group of leading Thai and American visionaries with extensive experience in the private, public, and academic sectors, as a response to Thailand’s remarkable development as a market-based economy between 1970 and 1990. Today, most of the programs and activities conducted by Kenan Foundation Asia are devoted, perhaps not entirely, but mainly, to empowering people with the knowledge, technology and skills critical for a better future. As a former Chairman, I am pleased that my hope for Kenan to work in direct partnerships with people in need, as a people to people organization, is being realized. Some of the individuals who were instrumental in founding the Kenan Foundation Asia include Frank Kenan, the former Chairman of the Kenan Charitable Trust; Owen Kenan, a great friend to Thailand who helped secure Kenan family funding: Tom Kenan, who wanted to be here tonight, but was unable to join us; Dr. Asavin Chintakananda, who went on to become Kenan’s first president; and Jack Kasarda from the Kenan Institute of Private Enterprise. Many of the Institute’s early friends have moved on, but the relationships that Kenan has forged with their organizations including USAID, the University of North Carolina at Chapel Hill, and partners all across the Thai government continue to flourish. Even though I retired from the chairmanship of Kenan Foundation Asia over 10 years ago, I have maintained close ties with this organization. My chosen successor, Khun Nitya Pibulsonggram, former Ambassador of Thailand to the United States, is well remembered for the outstanding services he rendered to this organization. After his passing, we were fortunate to have Khunying Jada Wattanasiritham, who has worked with me at Siam Commercial Bank for two decades, assume the chairmanship of Kenan. And we now have a young president who is full of ideas, full of energy and full of good intention – Khun Piyabutr Cholvijarn, to usher in a new phase to the Institute. We all wish Khun Piyabutr much success in further building the Kenan Institute. Kenan Foundation Asia has reached its 22nd year of operation and this achievement would not have been possible without the gracious support of many of you who are here tonight. I am now 85 years old, and have not attended the annual reception for quite some time but I do recognize many faces among those in the audience tonight and am especially pleased to see our American friends. I believe it was fate, some 25 years ago that brought Chapel Hill to Thailand. The Kenan family has been most generous, not only in terms of financial resources, but also due to the longstanding support from Frank, whose sons, Owen and Tom, continue to inspire us to do things that immensely benefit people across Southeast Asia. Over 10 years ago, when I was at the beautiful Chapel Hill campus to receive an honorary degree, I had the opportunity to meet a number of notable faculty members whom I still maintain contact with. Many Thai students now go to Chapel Hill and with the active alumni who are growing in numbers, the relationship between Chapel Hill and Thailand has become even stronger. I am also delighted to see the Thai government units with us tonight and applaud their intensified efforts in working with Kenan to improve the lives of the Thai people. The challenges facing Thailand today have less to do on the military and political landscape, but more to do on education, on empowering people to be independent, on good governance, on transparency and accountability, and of course, on the freedom of expression and freedom of assembly. Throughout the history of Thailand, any progress that we have made toward the goals I mentioned has been interrupted by political or other issues, events beyond our control. But I think the private sector and the people, in general, understand what the real challenges are. As long as we have the energy and the vision to pursue these noble goals needed to achieve an acceptable form of democracy in Thailand, then we will reach our ultimate goal. I sincerely believe in the power of the people, and I believe in the fundamental goodness of the Thai people. Thank you very much to all of you for your presence tonight. I hope that you are proud of the progress we have made and will continue to be an integral part in the future of this important venture.